You don’t have to be old to suffer from a back pain. Even though elderly and middle-aged people are more prone to this type of pain, young people can also feel its symptoms. They include back pain, hip pain, difficulty sleeping, reduced flexibility of the spine, etc. The main causes of a backache are poor sitting posture, muscle tension, lack of physical activity, improper diet, excessive physical labor, arthritis, and pregnancy. If you’re one of the many who suffers from a backache, then you must know that this type of pain can interfere with your daily activities. Luckily, there are some natural back pain remedies that can help relieve your debilitating pain and allow you to live your life to the fullest. Did you know that you can use ginger root to reduce your back pain? 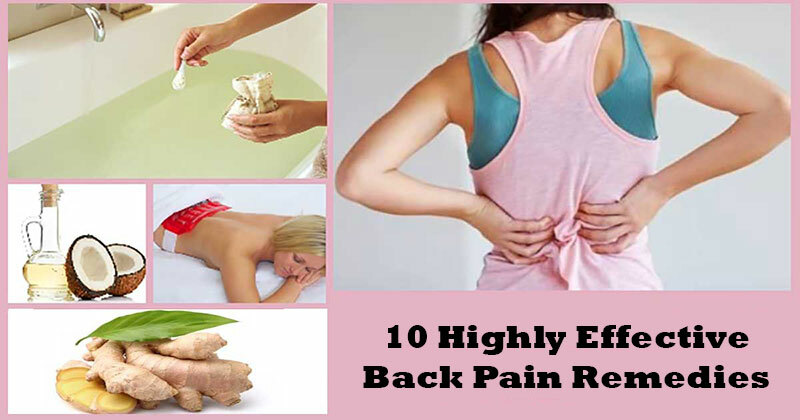 That’s right ginger is one of the best back pain remedies! This potent plant, which can also cure vomiting, contains anti-inflammatory compounds that reduce the back pain. Rub some ginger paste on the painful area and then apply some eucalyptus oil. Another way to use ginger for back pain relief is to take it as a tea. Add 4-6 thin ginger root slices in 1 ½ cup of water. Boil and simmer for around ten minutes. Leave the mixture at a room temperature and once it cools strain it. Then, add some honey to taste and drink it. You can have this ginger tea 2-3 times a day for several days, or until your condition improves. Alternatively, make a tea using 1 teaspoon of ginger powder, ½ teaspoon of garlic cloves, and ½ teaspoon of black peppercorns. Boil one cup of water with 8-10 basil leaves until it evaporates to half. Allow the mixture to cool before adding a pinch of salt. If you have severe pain, drink this concoction twice a day, and if your pain is mild, drink it once a day. This is another great natural remedy for a backache. You might know poppy seeds as khus khus. You’ll need one cup of poppy seeds and one cup of misri (rock candy). Grind them together and consume 2 teaspoons of the mix with a glass of milk, twice a day. Almond oil, eucalyptus oil, coconut oil, and olive oil are just some of the many herbal oils that can help relax your muscles and relieve your pain. Heat your favorite herbal oil and massage it gently over your back. Consume 2-3 garlic cloves on an empty stomach. Use some garlic oil to massage your aching area. Here’s how to prepare it at home. Heat some sesame oil, mustard oil, and coconut oil on low heat and add eight to ten garlic cloves, Fry the cloves until they turn brown. Next, strain, and allow it to cool. Now use the oil to massage your back. Let it act for a while and then enjoy a warm bath. The analgesic properties of wheat can help reduce your back pain. Put a handful of wheat in water and soak them overnight. The next morning, add coriander and cuscus grass powder. Next, pour a cup of milk and boil the mixture until it thickens, which will take few minutes. Drink twice a day. Ice packs can help reduce swelling and pain. As an alternative, you can use a bag of frozen veggies. Wrap a plastic bag filled with crushed ice in a towel. Place the ice pack on your aching area and leave it for 10-15 minutes. Repeat this several times with 30 minutes’ pause between each application. Another option is to use hot compresses. One of the many health benefits of Epsom salt is reduced inflammation and back pain. Make a thick paste using hot water and Epsom salt. Then, soak a towel in the paste and drain the excess liquid. Place the towel on the affected area. Besides relieving your pain, the heat will lower any swelling. Another option is to soak in an Epsom salt bath for 30 minutes. Just add 2 cups of the salt into the how water and enjoy. One of the causes for your backache might be tense muscles. A good way to relax them is drinking a cup of hot chamomile tea. To prepare your own chamomile tea, boil one cup of water with a tablespoon of chamomile flowers. Allow them to steep for ten minutes before straining. Drink 1-3 cups of tea a day. Of course, there’s the option to buy chamomile tea if you don’t feel like preparing it. Healthy muscles and strong bones require calcium. One good source of this mineral is the milk. So, to prevent and relieve your back pain, give your body the daily requirement for calcium. First, you can drink milk on a regular basis. Feel free to add some honey to taste. Second, mix cuscus grass and brown sugar in 1:1 ratio and consume it with a cup of warm milk. You can have this mixture twice a day. All of these back pain remedies are natural, so you can try them and see what works best for you. In case none of them helps you, it’s best to consult your physician. We must mention that exercises are strongly recommended for treating back pain. If you know any other natural back pain remedies, share it in the comments below for the other back pain sufferers. I was really happy to know that I have the stuff within my kitchen to get rid of a backache. Thank you for letting us know about the super benefits of the household items. Keep sharing and spreading the knowledge.